During the promotion of Rogue One: A Star Wars Story, one question kept coming up: what were those reshoots all about? Sure, every film has reshoots but the narrative surrounding the Rogue One reshoots was one of large portions of the film being reshot, tonal changes, and (alleged) displeasure from the studio. While we'll likely never know the full story of what happened with the reshoots, we now have a bit of an idea as to what specifically in the film they effected. Yahoo! Movies sat down with Rogue One editors Colin Goudie and John Gilroy, who shared some details about the reshoots. "They gave you the film that you see today. I think they were incredibly helpful. The story was reconceptualised to some degree, there were scenes that were added at the beginning and fleshed out. We wanted to make more of the other characters, like Cassian’s character, and Bodhi’s character." One of the significant aspected that the reshoots changed were the character introductions. Gilroy explained that, "The scene with Cassian’s introduction with the spy, Bodhi traipsing through Jedha on his way to see Saw, these are things that were added." "The point with the opening scenes that John was just describing was that the introductions in the opening scene, in the prologue, was always the same. Jyn’s just a little girl, so when you see her as an adult what you saw initially was her in a meeting. That’s not a nice introduction. They got there eventually in the film, but this way we came in on the ground running, which was better." "It changed quite a bit. The third act has a lot going on. You have like seven different action venues, the mechanics of the act changed quite a bit in terms of the characters, and I don’t want to go into too much detail about what had been there before, but it was different. Because you needed to figure that out, and everything else changes. Everything was connected to everything so doing something to one venue would change all the other venues, so really we had to… we were working on that until the last minute, because we working closely with ILM, they were giving us temporary shots and we’d put them in, we’d work them, we’d reconceive again." 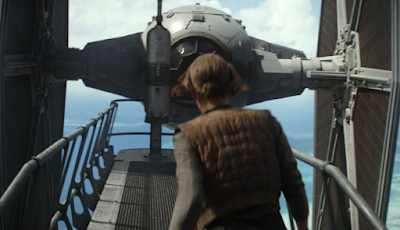 You can read the entire interview with Gilroy and Goudie, where they discuss some of the challenges to editing Rogue One, Red and Gold Leaders, and more, over at Yahoo! Movies. There are always going to be questions about how much of Rogue One changed. Based on this it sounds like most of the changes were towards the beginning and end of the film, with most of the middle remaining intact from the original version. Based on what Gilroy and Goudie told Yahoo, it certainly sounds like the changes to the opening were drastic improvements to the film. There are still some questions (like what was Saw's role originally and why did that change), but at least now we have seen the film and can begin to piece things together based on comments from the production crew and what was cut from the trailers.